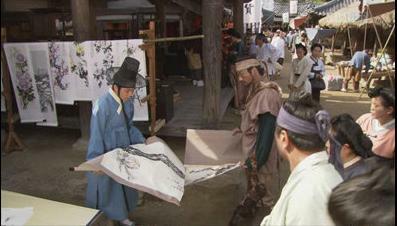 Painter Of The Wind Episode 1: Interesting! The new series from SBS just recently aired and I was able to watch the pilot episode. I did not have any expectation from it since I am not a fan of both the main leads although I always find Moon Geun Young cute and adorable ever since I saw her in Little Bride ages ago. Park Shin Yang I saw in Lovers in Paris and he’s okay. I heard he was good in War of Money. Anyway, if the whole series will be based on just the pilot episode, The Painter of the Wind will definitely be awesome. MGY as a ‘pretend’ boy, Shin Yoon Bok was excellent. PSY was okay. I can’t say much about him since his character do not really demand any real “acting” this early. It is a different case with MGY since she’s doing a Eun Chan. Remember Coffee Prince? Based from the first episode she nailed it just like Yoon Eun Hye. Amazing because this is her comeback to the drama-fold after 5 years. Cinematography and music was great. The story is very interesting since I am not familiar with it. I read somewhere that it was based from a novel. I hope the fans of the book won’t get disappointed with the TV version. Okay, let us sift thru episode 1. It is quite obvious that it includes palace intrigues. When MGY secretly painted a women deep in her thoughts, everyone was behaving like it was a huge deal. Apparently it is the Queen and it somehow symbolizes that the Queen is doing something immoral, actually she does have an affair with a buddhist priest or monk. Before we go to all that, obviously, it is still a romantic comedy drama mixed in and so allow me have PSY enter the story. Also, before I rushed in to their story, let me just give a background on the their character, that is if you don’t know yet. MGY’s father was murdered and so she vows that she’ll get the killer and off she disguises as a boy to be able to study painting. During those time painting is for boy’s only hobby. PSY is an older guy who is a master painter and would later be her mentor. Do you already see where this is all heading? During the first episode from what I can still remember, well, (just fragments of it really), MGY and PSY first met when they both got interested on a certain painting. They argued then unfortunately, it ripped in half. MGY offered to make a replica since she insisted that she is familiar with the painter and the painter’s style so she can definitely paint another one just like it. 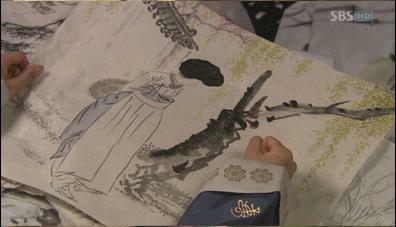 The painting was quite expensive and she was asking PSY to pay for the other half of the amount. Anyway, he rushed off to the palace since he was called to investigate a certain painting, and help discover who painted it. On the other hand, MGY was so excited to see their new teacher. She bumped into PSY again and told him to get out of there before the prominent painter/teacher comes in. She surely have mistaken him for an ordinary vendor. Yes, I know, it’s obvious already that PSY is that prominent painter/teacher. I am quite excited on how the relationship will grow from here. By the way, her roommate is quite fond of her and that will altogether add another twist on the story. Even with the age difference, they do look good together. My korean is not that at par with the native speakers and probably will never reach that stage so I do get a little help from my friends. Hey, thanks! I cannot do the usual recap thing I did from the past. I won’t attempt to do another one because I simply dont have the time and I will just disappoint people by not finishing them. What I will do is pop in here everytime I was able to watch an episode and just tell you bits and pieces of it. So again, based from the first episode, I highly recommend this series! I watched the 1st episode…i like MGY’s friend i think his falling for Shin Yoon Bok..hahah!! the way he looked at Shin Yoon Bok ! it’s really funny!! if only he know Shin Yoon Bok was a girl haha!! Where can i find the episode 2..hmmmm can’t wait to watch it..if you have link..pls email me jennie_soriano27@yahoo.com..^^ thanks!! more power to Painter of the wind..MGY fan! you can also watch here..there is sub..but not updated sub..
hmmm …jennie try to watch in viikii..there’s sub there ..i think..but it will be updated for 2 days..well thanks for the add..chat chat!? yes..im always watching this in viikii but sometimes the sub are not so good…but anyway i can understand..good job for the subdubers….cheers!